As graphic designers and wedding planners we are always looking for trends in the world of weddings. Actually having a wedding website is a huge must have, so we will share with you our vision regarding this topic. More and more often we have couples who ask us for a website to their wedding, in fact we think this is a pretty smart idea! This element can be a very good way to complement the information you have on the invitation (or don’t having any invitation at all!). You can have a clean invitation with not too much info and the website can work as a complement with all the extra stuff your guests need to know about your wedding day. There you can share in detail the different moments of your wedding, pictures of the venue and their location on the map, if it’s a destination wedding you can suggest some hotels or other kind of accommodations for your guests as well as promo codes. If needed you can share options for transportation until the venue, activities to do around or places to visit. You can inform your guests regarding the dress code, having an rsvp form with which you can confirm the attendances via e-mail and also other kind of things about each guest (food allergies, special requests, etc.). As you can see it’s possible to put there so many information that can be very helpful for you and your guests. We love clean and beautiful designs so we always try to suggest to our clients websites like that. It’s really important to have a user friendly website which is clear to your guests and works all over the world. And a simple design helps everything makes more sense. In addition to this a wedding website is a part of the wedding stationery so it’s logical that it should follow the concept and graphic language of the other designs. So for us it makes all sense that the colors, the typography, some kind of pattern or other details that you have on your invitation should also be present on the website. 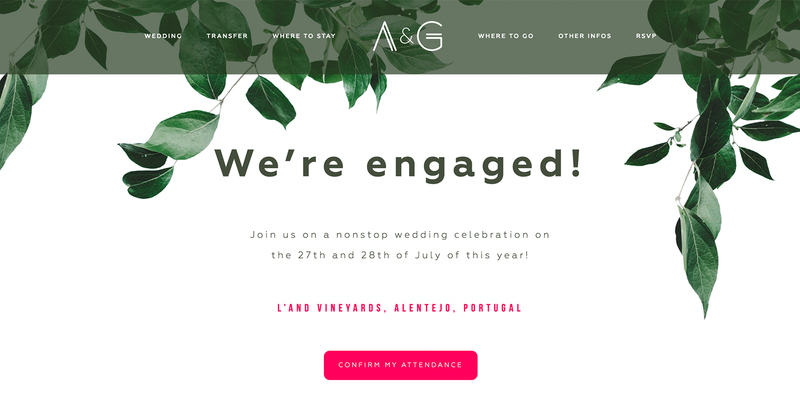 Here you have two cute websites designed by Muza for two couples who will get married this Summer in Portugal. With the same template we designed two different websites - one more organic, fresh and colorful and another one a little more geometric and classic because of the dark blue color. Both weddings are so unique that with the same layout you can build two completely different solutions. If you want to get married in Portugal (Lisbon, Porto, Algarve, etc.) or in another part of the world and if you love our sense of style, we can be the right team to do the graphic design including the website for your wedding! Hope you like this examples and feel inspired!